The perfect gumball and candy vending machine for a Baseball fan! 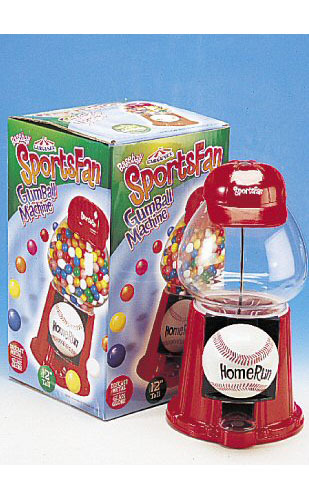 Beautifully detailed with a baseball handle you turn to dispense the candy and a lid designed as a baseball cap! Measures 12" tall and made from cast aluminum with a glass globe. Comes in a brightly colored full graphic box for easy gift wrapping. Holds up to 32 oz. of Gumballs, nuts or candy. I love baseball! Glad to see there is a gumball machine for baseball fans.